The year is 1800. A thirty-mile trip takes a day or more. John Adams is President, but most folks in the Blue Ridge have never seen or heard him speak. There’s always water to carry, food to process, and wood to chop. 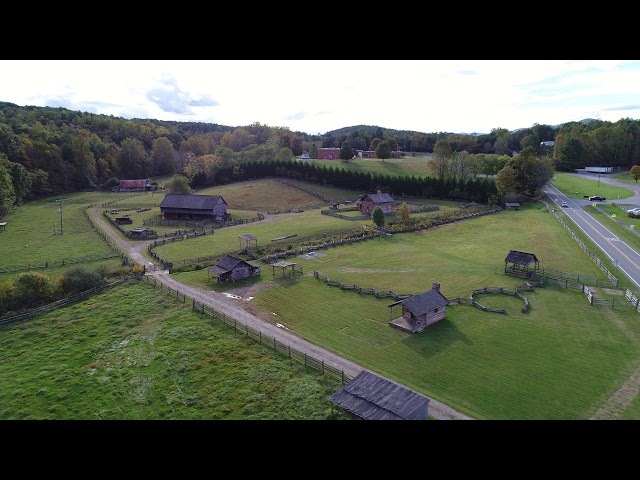 Immerse your senses in 1800 rural Blue Ridge life at the BRI&M’s Blue Ridge Farm Museum, a re-created Virginia-German farmstead. Join our costumed interpreters in a host of household and farm chores, including preparing meals over the open hearth, driving oxen, blacksmithing, and tending heirloom gardens and historic breeds of animals. Homeschool Day Camps – Hands-on museum experiences specifically for homeschoolers. Follow us on Facebook for dates and other information. BRI&M Workshops – The menu changes from year to year, but we’ve done everything from herb lore to oxen raising. Follow us on Facebook for dates and other information. Group tours are available by reservation any day April through November. Other hands-on programs and lectures are available year-round by special reservation; call for details and prices. The Farm Museum is open to non-reserved walk-in visitors Saturdays 10 a.m. to 5 p.m., Sundays 1 to 5 p.m., mid-May through mid-August. Admission is charged.